2 comfortable double rooms with bathroom, shower, hair dryer telephone, sat TV, in-room safe. Comfortable double room with bathroom, shower, hair dryer telephone, sat TV, in-room safe, most with view of the Dolomites and balcony. 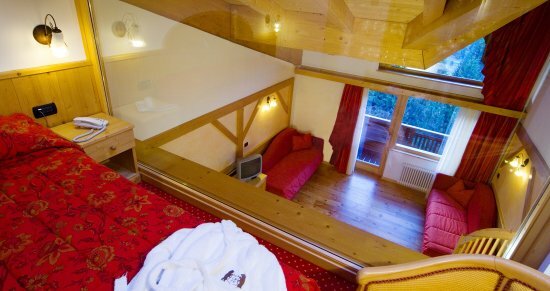 Stylish double room with bathroom, tub/shower, hair dryer telephone, sat TV, in-room safe, most with view of the Dolomites and balcony. The prices are per person per day with half board plan. For the Classic Dolomites and Superior rooms, dinner is in the grand buffet restaurant, while for the Junior Suite and Baita Suite, dinner is in the restaurant with waiter service. The recidence prices are per week. Bed & Breakfast: reduction of € 20,- per day per person. Family offer: 2+2=3 for kids under 12 years in the same room with the parents. For stays for babies from 0 to under 2 years: overnight free, eventual consumed meals extra. Swimmingpool for kids with super-slide for free. Single room: € 20,- per day for Classic and Dolomites rooms (single bed). Waiter table service: € 5,- per person per day for Classic, Dolomites, Superior and Junior Suite rooms.